Antibody-dependent cellular cytotoxicity (ADCC) is one major mode of action of therapeutic monoclonal Abs (mAbs). This immune reaction relies on mAb dual activity: the variable region ensures the specific recognition of an antigen expressed by a target cell, and the “crystallizable fragment” Fc in the constant region binds to Fc receptors (FcRs) at the surface of effector cells. Depending on the Ab isotype, the Fc region displays different binding affinity for activatory FcRs . 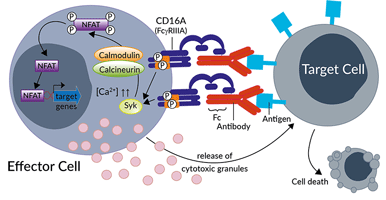 ADCC is mediated by Natural Killer (NK) cells which express FcγRIIIA (CD16A), activatory receptors for IgGs. 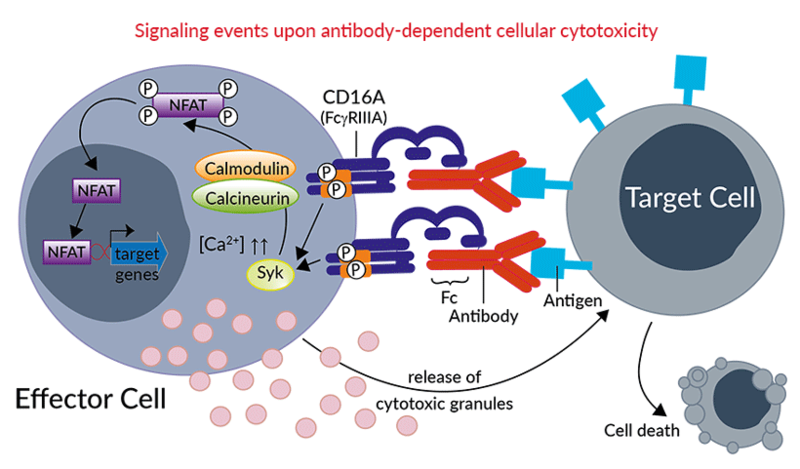 FcγRIIIA cross-linking at the surface of NK cells leads to downstream signaling, including increase in intracellular calcium concentration, calicneurin/calmodulin-mediated dephosphorylation of NFAT (nuclear factor of activated T cells), allowing its nuclear translocation and binding to promoter regions of ADCC relevant genes. Ultimately, the effector cells release cytotoxic granules which kill the target cells . a collection of clinically-relevant mAb isotypes with modified effector function potencies. 1. Quast I. et al. 2017. Regulation of antibody effector functions through IgG fc N-glycosylation. Cell. Mol. Life. Sci. 74(5):837.